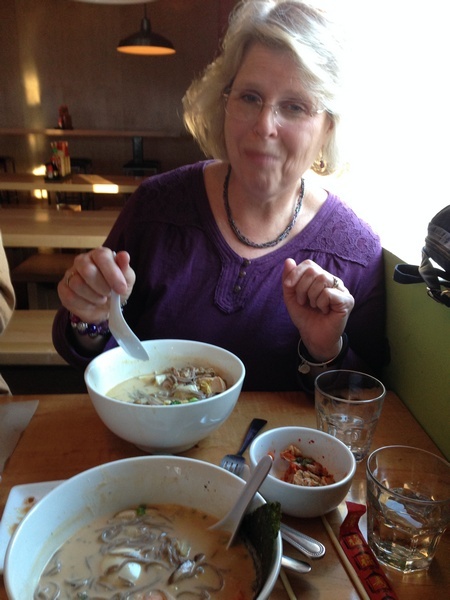 Bonnie, Paul, Wes and I went to Yum Yum Noodles in Woodstock for Bonnie’s birthday dinner. We shared appetizers, then Paul ordered their giant hamburger, while the rest of us ordered their signature soup. It’s called Yum Yum for a reason. I usually snap two or three pictures and pick the best one, but only snapped one this time. (probably was hungry and wanted to eat) It’s not the best picture–this is how Bonnie looks just as she’s about to bust out in a laugh–I should have waited 2 seconds longer. We were planning on ice cream at Mickey’s Igloo, but it was just too cold, so we finished our evening at the Saugerties Diner with coffee and dessert. Good times with good people. By the way, Wes found my journal. It was in the zipper bag we got from the funeral home. I had made a list in the journal of the thank you notes I wanted to write and took it with me to Bonnie’s when we wrote the notes. On the way home, I stuck the journal in the bag and totally forgot about it. Now I have to find another crocus picture. There’s still so much snow in our front yard, it’ll be May before we actually have crocuses here.